I had sort of forgotten there was going to be another SpongeBob Squarepants movie. Despite the show being a staple of my childhood (and let’s be honest, adult life), I forgot to watch the trailers when they first emerged sometime last year. So when recent promotional images depicted SpongeBob and co. as CGI superheroes for a sequel 10 years after the first film*, I was pretty apprehensive. Luckily, The SpongeBob Movie: Sponge Out of Water was much better—and much weirder—than anything I expected. The plot: During a grandiose airplane, tank, and robot-aided attempt at stealing the secret formula for the Krabby Patty, the document vanishes into thin air as Plankton (Mr. Warburton) and SpongeBob (Tom Kenny) are struggling for it. A Krusty Krab rule that no employee is allowed to memorize the formula leads to a Krabby Patty famine, instantly plunging Bikini Bottom into a Road Warrior leather-clad apocalypse. While Mr. Krabs (Clancy Brown) and the rest of the town are ready to unleash some angry mob fury on Plankton, SpongeBob helps the innocent single cell organism escape, at the cost of the town’s wrath. SpongeBob convinces a reluctant Plankton that the two should work together to find the real culprit, and the two set off on a journey that will send them backwards and forwards in time, into SpongeBob’s mind, and into the out-of-space-and-time watchtower of an all-seeing mystical cosmic dolphin named Bubbles (Matt Berry). Eventually, the trail leads to dry land, and to the ship/car/restaurant of unscrupulous pirate and food-truck proprietor Burger-Beard (Antonio Banderas). 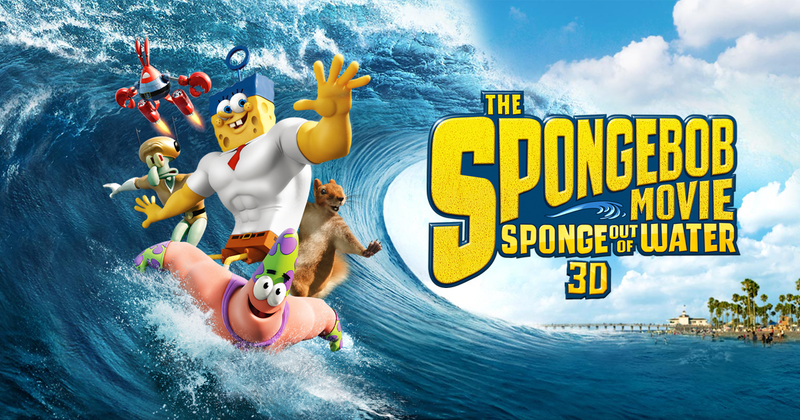 With the aid of Mr. Krabs, Patrick (Bill Fagerbakke), Squidward (Rodger Bumpass), and Sandy (Carolyn Lawrence), SpongeBob and Plankton make the trek onto land and take back the formula and save Bikini Bottom from peril. If the synopsis is any indication, Sponge out of Water is a weird movie. From the main characters traveling around in a photo-booth time machine misadventures, to the main villain being a pirate burger chef in possession reality altering book that provides a frame story of sorts, to its awesome, if uncomfortably sexual closing credits (and time-stream traveling) song, this movie is a stranger beast than most kid’s movies. Strange, zany humor has always been part of the appeal of SpongeBob SquarePants, and with this film, the writers see their interest in non-sequitur visual gags and off-the-wall humor amplified with a larger film budget. As much as the first film had its share of superhuman David Hasselhoff cameos and Twisted Sister musical interludes, The SpongeBob SquarePants Movie was a pretty straightforward kid’s quest film. While Sponge Out of Water has a similar find-the-MacGuffin plot, it takes its time in actually progressing with the story. 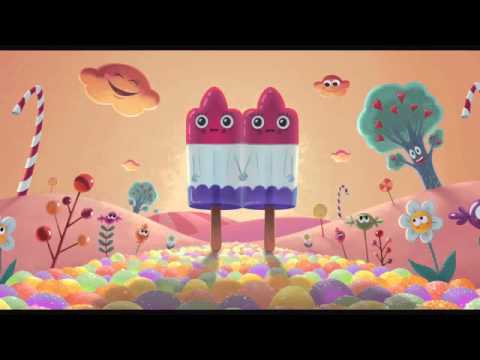 Plankton’s journey into SpongeBob’s candy coated, ultra cute inner-mind and The Shining parodying encounter with anthropomorphic twin popsicles (voiced by Garfunkel and Oates’ Riki Lindholm and Kate Micucci) doesn’t get them any closer to finding the missing formula, but Plankton’s response of vomiting a rainbow that gleefully exclaims “I love you, dad” is one of the funniest and most flat-out bizarre scenes I’ve seen in a kid’s movie in a long time. Paramount Animation, Nickelodeon MoviesThis is one of two Kubrick references in this PG rated kids’ movie, in case you’re wondering. Admittedly, a lot of the mileage you get out of the film is going to depend on how much bizarre humor and deviation from actual plot you can put up with. Those going in expecting most of the run time to be devoted to a CGI SpongeBob in the real world will be surprised by how relatively short this sponge’s adventures out of water are in Sponge Out of Water, and anyone looking for a concise, plot heavy kids movie may want to look elsewhere. Refreshingly, most of the film is in traditional two-dimensional animation (not to knock the excellent CGI in the final acts of the film), and instead spends more time in wasteland Bikini Bottom and in strange, time and space hopping hijinks. The film’s eschewing of most of the show’s main cast for most of the film in favor of SpongeBob having adventures with the show’s only real antagonist might strike viewers as odd as well. Even Patrick, SpongeBob’s constant companion, is only a bit player until late in the film. Strange as the this absence is, it’s rarely felt, as the mismatched partnership SpongeBob and Plankton works incredibly well, especially as the two strike more of a friendship and Plankton becomes accustomed to the unfamiliar concept of teamwork (or tee-am work, as he calls it). If Patrick and SpongeBobs’ enduring friendship was the central strength in the sweet-natured SpongeBob Movie, being paired with his distrusting opposite suits this film’s odder ambitions. Also unique is the film’s relative lack of celebrity cameos. In addition to the ‘Hoff, the first SpongeBob movie rounded out its cast with Jeffrey Tambor, Scarlett Johansson, and Alec Baldwin, whereas, outside of the aforementioned Garfunkel & Oates team, Sponge Out of Water is pretty much just the show’s cast. While other recent critically acclaimed kid’s films like The Lego Movie and The Muppets franchise are cornucopia’s of celebrity appearances and voices, its rare to see a kid’s film, particularly from a massive property like this, go without the celebrity boost. 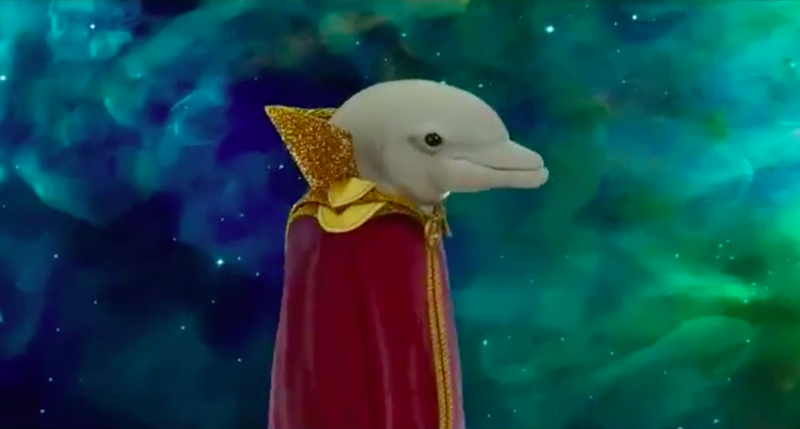 I can imagine the urge to have Bubbles, the mystical space Dolphin voiced by Alan Rickman or some similarly intoned actor was tempting, but in its way, the lack of cameos keeps you absorbed in the film without pulling you out as you try to place a voice with a star. Oddly, it’s when the film gets around to following through with its plot that things get slower. SpongeBob and his newly-CGI friends acclimating to a foreign and oversized world and finally confronting Banderas’ fantastically goofy pirate –he does champion work here seeing as he only ever interacts with them and a gang of CGI seagulls— moves at a brisk pace and has tons of charm, but it lacks the same comedic punch that the earlier 2D portions of the film had. Similarly, the superhero personas teased in the promotional images, felt a little tedious. The final conflict, in which the recently super-powered sea creatures give chase to Burger Beard’s ship to retrieve the secret formula felt too much like the big end-of-film conflicts of recent superhero films, without doing enough to poke fun at them to make it truly stand out. The superpowers of the main characters—particularly the gag of Sandy turning into a giant hyper-realistic squirrel and Patrick’s ability to summon and control ice cream—were in themselves pretty clever, but could have been put to better use. Nearly 16 years into its run, SpongeBob SquarePants is now among the elder statesmen of cartoons, and Sponge Out of Water reflects this status. Confident in its place as a staple of kid’s entertainment and pop culture, it can afford to make a film that’s at times surprisingly weird, without relying on celebrity cameos or aiming for sentiment. The SpongeBob Movie: Sponge Out of Water is a strange surprise from a known quantity and easily one of the funniest new film of the year so far. *The first SpongeBob movie came out 10 years ago. Let that sink in. Great review. I haven’t seen the original movie or ever properly watched the cartoon, but I saw a trailer for this recently and thought it looked quite good! I’ll definitely give it a try when it’s released here. Thanks! Definitely check it out when you get a chance!